It's ironic that this film's title for a time became short hand for the sort of high handed right wing shoot first ask questions later macho cowboy vigilantism which some people argued that animated such politicians as Ronald Reagan and inspired or infused such film series as Death Wish or Dirty Harry. 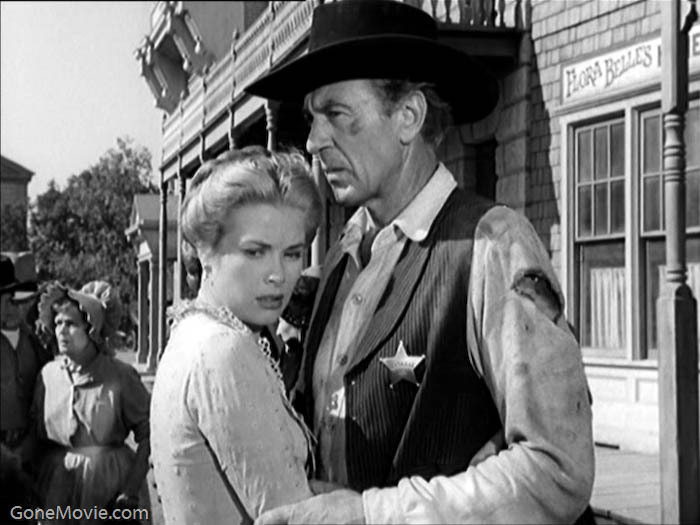 At the time of its release many people who saw it understood High Noon as a left wing allegory about McCarthyism and blacklisting. 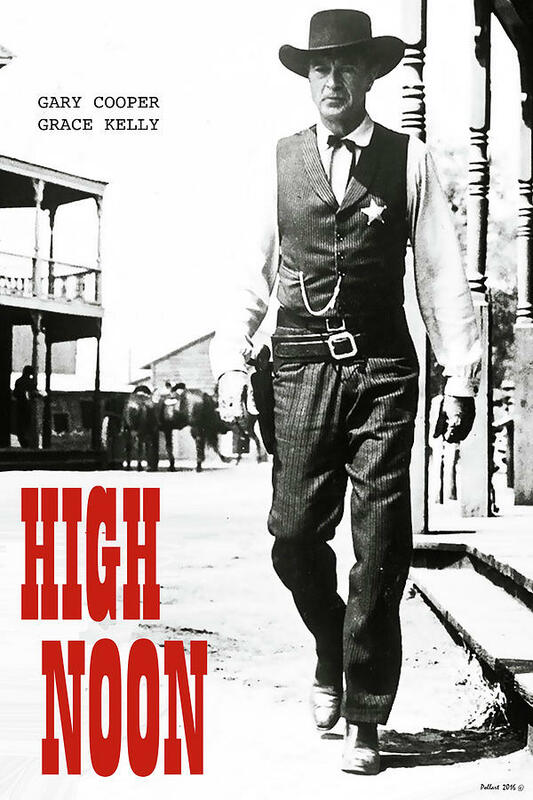 Right wing iconic actor John Wayne, who was in favor of blacklisting, if not necessarily black people, hated High Noon, calling it unAmerican. Wayne boasted about helping to run High Noon's writer, Carl Foreman, out of the country. Wayne declined to act in the lead role. High Noon bothered Wayne so much that he went so far as to help make an answer movie to High Noon, Rio Bravo. In Wayne's mind Rio Bravo "fixed" a lot of the problems with High Noon. 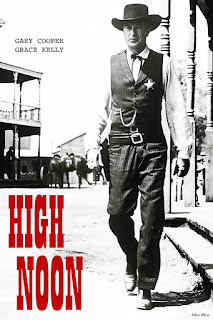 Some people consider Rio Bravo to be at least as good as High Noon while others say High Noon is in a class by itself. Well you've have to watch both movies to make that call but I think, politics aside High Noon remains one of the best Westerns ever made. 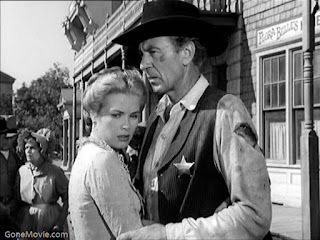 It's also a matter of some irony that the film's lead actor, who was in his own right a icon of American masculinity, Gary Cooper, was also quite conservative in his personal life and a friend to John Wayne,. It just goes to show that art can make strange bedfellows. Although this film was directed by Fred Zinnerman it was produced by legendary filmmaker Stanley Kramer who was famous for such social message films as The Defiant Ones, Guess Who's Coming to Dinner, Inherit the Wind and of course the slapstick It's a Mad Mad Mad Mad World. This movie is shot in glorious black and white and has a short running time that more or less approximates the timespan of the filmic events. The characters are not sharply drawn with everything filled in ahead of time. The actors make the film here. It's skillful writing and of course acting. Marshal (soon to be ex-Marshal) Will Kane (Cooper) is no superhero. He's not overly muscular and doesn't have a whole lot of pithy one liners to toss off when he's arresting bad guys. He's old. Cooper looks like he's in physical pain throughout the film and may well have been. He was suffering from ulcers, hip and back problems and had just broken up with his wife. Maybe Cooper was method acting in this film? I don't know but it's quite clear that his character is looking forward to retiring and settling down to married life with his young new wife to be, Amy (Grace Kelly). Amy's a Quaker and pacifist which Will isn't, but that shouldn't cause a problem as Will's getting out of the law enforcement and killing business. He and Amy are going to move to another town, open up a store and get to work making babies. Will has promised Amy that. Amy doesn't like Will's work or the fact that he has to be violent with violent men. Well best laid plans and all that. It seems that a criminal and killer named Frank Miller (Ian McDonald), who has a personal grudge against Will, has been released from prison. Miller is younger and more vicious than Will. Miller's is going to arrive on the noon train. At that time he's going to kill Will Kane and anyone else who gets in his way. Miller's gang is already in town. Amy wants Will to run away and leave Miller to the new Marshal. Will looks for deputies and help but finds little support or appreciation for any of the work he's done over the years. In fact, much as with similar righteous characters in print and film Will learns that plenty of people have their own petty and not so petty resentments of him. Will must decide whether to stay true to his convictions no matter the cost to him and others or do the prudent thing and run away. Although as mentioned when this film was created, many people had the then current anti-Communist hysteria in mind, the themes of courage, cowardice, risk, reward, and manhood are universal. They belong to everyone. Even if you're not a big fan of Westerns you probably ought to see this film. It is not a violent film by today's standards. Lon Chaney Jr., Katy Jurado, Lloyd Bridges, Thomas Mitchell, Harry Morgan ( later known as Colonel Potter from M.A.S.H), and Lee Van Cleef also star.